Shippy 4th/Ruo Xi moment: One of the servants lets a doggy run loose. The doggy goes over to 4th, and all the princes and maids freak out. Omg, 4th + fluffy little dog. Best thing ever. Ruo Xi quickly gets back the dog, and 4th just does his little smirk. LOVE!!!! 14th confronts Ruo Xi and asks what happened ever since the expedition. He points out that ever since then, Ruo Xi & 8th haven’t been the same. Ruo Xi ignores his question and excuses herself. 8th’s wives discuss Ruo Xi’s possible marriage to 8th. The other wife (I forgot her name..) tells Ruo Lan that she knows that 8th will be happy if he marries Ruo Xi. She’s willing to do anything to support 8th and make him happy. The two wives seem to reconcile with each other, as Ruo Lan clears up the misunderstanding that she’s taunting the other wife. Ruo Lan discusses the marriage with Ruo Xi, telling her that 8th is good to all his wives. She gives Ruo Xi the choice to accept/reject the marriage offer. I love all these snow scenes. So beautiful!!!! TIME FOR THE FATED MEETING IN THE SNOW!!!! THIS IS SO SAD. “Why must you force me? Why do you demand that I choose between two things that I have simultaneously? OMG. 8TH IS SO TORN!!!!!!! He ends up staying silent, so Ruo Xi infers that “no” is his answer. She warns him to watch out for 4th bro and other political figures. AND RUO XI LEAVES HIM STANDING THERE IN THE SNOW. OMG. I feel pretty bad for 8th bro now. He’s been lead on by Ruo Xi SO BAD, and now she’s just rejected him TO HIS FACE. Because he won’t give up the throne. I think Ruo Xi knows that 8th won’t give up the throne, but just wants him to prove his love for her. After all, she knows how history will play out, and she knows 8th can’t give up his dream. In the end, I think her motives for having him give up the throne are selfish, simply for her own assurance that he loves her. Ruo Xi runs away in tears. She slips on the snow and twists her ankle. 13th and 4th come across her and help her up. 13th goes to find some servants to carry her back to the palace, while 4th waits with Ruo Xi. Ruo Xi holds onto 4th’s arm (AHHHHHHH!!) and silently cries as it snows. Apparently 4th’s attempt at comforting Ruo Xi completely fails. She pushes him away and falls again. She starts throwing snowballs at 4th, who simply deflects them with his cape like it’s no big deal. LOVE 4TH. Ruo Xi continues to chuck snowballs at 4th as she gets carried away on a stretcher. I love these two. 14th is, expectedly, pissed off at Ruo Xi. I’m sorry, but I’m actually applauding 14th for trying to talk some sense into Ruo Xi. Yes, her decision is agonizing and hard for her too but, omg. Poor 8th. Left in the dust! By his loved one! But, 14th starts to get a bit violent, as he grabs Ruo Xi’s arm and taunts her. 13th and 4th to the rescue!!! YAY! 14th backs off, and 13th and 4th have a buddy-buddy talk with Ruo Xi. 13th offers to listen to Ruo Xi’s troubles, but she declines. Ruo Xi tells 13th about Min Min’s feelings for him. He says that he has no feelings for her. 4th simply tells Ruo Xi to let her ankle heal completely. OMG I LOVE 4TH AND RUO XI. He doesn’t say much to her, but he obviously cares for her in a different way than 13th/8th. He respects her space and doesn’t press her to tell him what’s on her mind. ^Um…I just put that because of how pretty it is. ._. Love how it shows the architecture. Back at another expedition, we have a circle of glances, as Min Min looks at 13th, 13th looks at Ruo Xi, Ruo Xi looks at 4th, 4th looks at Ruo Xi, and 8th looks at Ruo Xi looking at 4th. Very intense. Ruo Xi breaks the news to Min Min that 13th doesn’t have any feelings for her. Min Min wonders what part of her he doesn’t like. And to add to the drama, Min Min finds out that 14th is actually a prince, not Ruo Xi’s secret lover. Min Min is angry at Ruo Xi for lying to her and using her to hide 14th. She threatens to tell the emperor the truth, and rides off in a fit of anger. 14th tells Ruo Xi to put all the blame on him if the emperor finds out, since he’s a prince. I admit it. 14th was really cool in that scene. 13th and 14th catch up with Min Min and ask her not to tell the emperor. Min Min agrees not to tell him only if Ruo Xi wins in a horseback riding race. Ruo Xi accepts Min Min’s challenge and wins. Min Min quickly agrees to forgive Ruo Xi. She only wanted to annoy Ruo Xi a bit to get back at her for lying. Ruo Xi cutely hides behind 13th’s back, saying that she’ll just hide behind this dependable hero. Ahahaha. 14th and Ruo Xi ask 13th not to tell the emperor about 14th sneaking into the camp. 13th agrees because of his friendship with Ruo Xi. Ruo Xi does the peace sign, and 13th does the peace sign back. 14th looks at them like, “What the heck?” 14th has yet to join the Progressive Thinkers In The Qing Dynasty Club. ^I love Min Min’s hairstyle! Min Min is told by her father that she’s got an arranged marriage with a prince. She doesn’t want to be in a loveless marriage. Ruo Xi reasons with her, saying that if she keeps on looking at the moon, (aka 13th) she won’t ever get to see the sun (possibly the new prince guy). Ruo Xi prepares a special performance for Min Min. Min Min does a graceful dance that’s absolutely BEAUTIFUL!! All the princes gawk at her. 4th cutely imagines Ruo Xi in the place of Min Min, dancing only for him. For once, 4th doesn’t get a fake scene. YES!!!! This one is so pretty!!! Everyone is impressed by Min Min’s performance (and at Ruo Xi for directing it). Min Min finally gets to hear 13th play the flute. She cries as she hears his flute playing. Aww. I love Min Min’s outfit/hairstyle, especially with the red ribbons. 4th is basically the only one that speaks the truth to Ruo Xi. No matter how much she avoids her marriage and vows to become a nun, the truth is that she’ll get married eventually. She needs to evaluate her options wisely if she doesn’t want to end up in an unhappy marriage. Which….4th should’ve told her BEFORE she rejected 8th. ANYWAY, I like that 4th is blunt and straightforward with Ruo Xi. “The palace is the worst place to dream. I advise you to wake up and think of your next step. When the matter finally comes, you won’t be able to do anything. ^4th & 13th standing all dignified with their umbrellas. 4th is investigating the corrupt use of funds that were supposed to help the citizens. He finds out that 9th bro is part of the fiasco, and consults 8th about how to handle this situation. Eventually, the emperor calls of the investigation, so the matter blows over for now. 13th asks Ruo Xi what she thinks should be done. Ruo Xi says that even 9th bro should be punished for his wrongdoings, so that corruption won’t prosper in the future. 13th suddenly says that he’s gotta go. He leaves 4th and Ruo Xi alone. AHAHA they totally planned this. 4th hands a present to Ruo Xi, saying “It’s nothing.” I LOVE 4TH. Ruo Xi tries to refuse the gift, so 4th calls out “14th bro!”. Ruo Xi quickly grabs the gift and turns around to see if 14th is there. He’s not–4th bro tricked her! And then he walks away really quickly, telling Ruo Xi not to follow him in case 14th sees. LOL. So Ruo Xi is stuck holding the gift. 9th bro is pissed off at 8th over the whole corruption ideal. He goes drinking, and is prompted by the other guys to have some fun with Wu Lu (13th’s courtesan friend). They try to force Wu Lu to stay and drink with them, only to be interrupted by 14th. 14th angrily escorts Wu Lu out of the room. Wu Lu doesn’t put the blame on 9th, only asking 14th not to tell 13th about this. She says that she’s scared that 13th’s reputation would be scarred by hanging out with her. 14th says that 13th wouldn’t care about his reputation anyway. By the way, I love Wu Lu’s hair ornaments. They’re so pretty!!!! I also like her hairstyle better than the ones they wear in the palace. 13th hears about what 9th did to Wu Lu. 10th, 14th, Ruo Xi, and 9th are hanging out when 13th comes storming in. He’s about to beat up 9th, but 14th and Ruo Xi hold him back. 10th holds 9th back and quickly takes him away. ANGRY 13TH! AHHH! I LOVE THE DRAMA! 13th, 14th, and Ruo Xi have tea together. 14th advises 13th not to let this matter blow out of proportion. Ruo Xi is furious at 9th for doing such a thing to Wu Lu. 14th scolds her for being so rash in talking against a prince. 13th, ever the cool one, says to tell 9th that if he does anything to Wu Lu or any other girls, he’ll kill him no matter what. I LOVE LOVE LOVE the friendship between 13th, 14th, and Ruo Xi!!! 13th stalks off, leaving 14th with Ruo Xi. 14th rants to Ruo Xi about how he’s in a fix because of defending Wu Lu. And then he says AGAIN that Ruo Xi should just marry 8th, because he won’t oppress her. Yu Tan tells Ruo Xi that Crown Prince has asked the Emperor to grant him a marriage to Ruo Xi. 14th, who’s with them at the time, immediately storms out and finds 8th to do damage control. Ruo Xi is depressed by her possible fate, and confides in Yu Tan. And time for 4th/Ruo Xi! Ruo Xi comes down with a fever. 4th comes in the room as Ruo Xi wakes up. She weakly asks for some water. 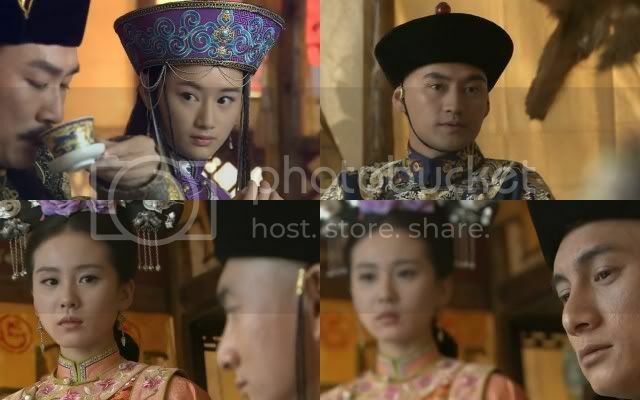 4th quickly gives her some water, and then Ruo Xi turns to see that it’s 4th prince! 4th says that she still might have a chance since the emperor hasn’t answered Crown Prince’s request yet. He helps Ruo Xi lay back down. AWWW. I love how careful he is with her. Right then, the song “Three Inches of Heaven” starts playing. The lyrics are SO PERFECT in this scene!!! And this is my favorite BBJX OST song, so this makes the scene even better! 4th turns to leave, but then Ruo Xi grabs his arm, and looks at him imploringly. 4th tucks Ruo Xi in bed, and kneels down beside her. 4th turns to leave AGAIN, and then Ruo Xi grabs his hand. AHHHHHH. She starts to sob silently, and 4th wipes away her tears and holds her hand. He gives her this look of “It’s gonna be ok” and leaves. Please excuse me while I go rewatch this scene for the 10th time. I’m not even kidding. 14th comes to visit Ruo Xi. He tells her she needs to delay the marriage request for 10 days. Ruo Xi thanks him, and 14th (echoing 4th) says that he already told her to choose her own husband. Now it’s too late! Like we all said, 14th, like we all said. And then for his recurring line, “It’s much better for you to marry 8th prince right?” T_T Ruo Xi thanks 14th as he leaves, and he simply raises his hand goodbye. Um, am I the only one that likes 14th more now? As in, before I didn’t really like him that much in the beginning, but now he’s likable? And he even has his cool moments, like this scene just now? Omg, I love 8th and his other wife, Ming Hui. Ming Hui is stealing the show by far from Ruo Lan. Ming Hui will always support 8th in whatever he does, and can’t bear to see him unhappy. Perhaps she didn’t love him at the beginning of their arranged marriage, (this hasn’t been clarified) but she’s put that behind her. She’s devoted her all to him, and recognizes that their marriage is a partnership, not just an inconvenience. Back in court, a corruption case is reopened. 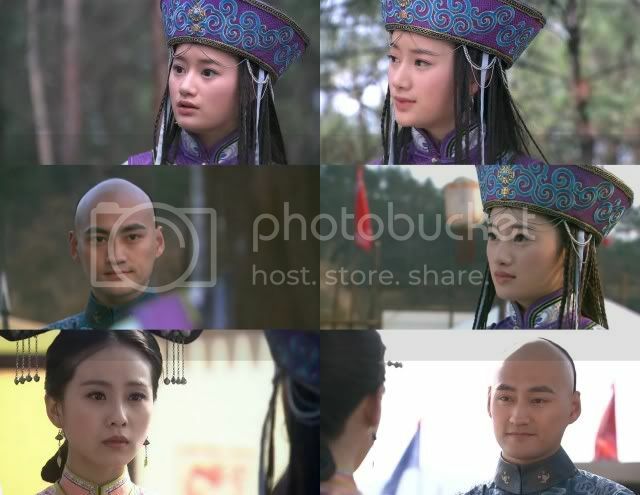 Ruo Xi realizes that this is 8th’s way of targeting Crown Prince, and thus delaying the marriage request. Crown Prince is linked to the corruption. The main point of this scene is that 4th and 8th have a VERY intense stare off. 8th can be pretty scary sometimes. Ruo Xi opens 4th’s present. It’s a magnolia shaped hair pin. She wears it with a smile. (She’s gonna fall for him, I know it.) Ruo Xi bumps into 4th, and she quickly takes off the hairpin. 4th asks why she took it off, and Ruo Xi makes up an excuse. And then she asks her to marry him. WHAT?